MySpace is a free online community composed of personal profiles aimed at a younger membership. To make your space look cool, you may have done a lot of things, but surely, creating a photo slideshow and then publishing it to MySpace could gain you much attraction from others. Want to make more friends on MySpace? Why not create a special photo slideshow to introduce yourself and upload? Want to share your excellent photos on MySpace? 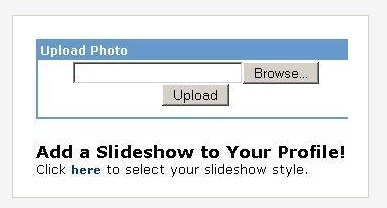 Why not try to use MySpace slideshow generator to upload your photo slideshow from your local computer? You are able to make your space unique and a bit different by using MySpace slideshow generator such as Photo DVD Maker to create gorgeous photo flash slideshows, and then insert the generated photos slideshow to MySpace website for widely sharing. To create photo slideshows that can be uploaded to MySpace, you need to download and install Photo DVD Maker at first. Photo DVD Maker includes 80+ free slideshow templates to meet your various requirements. You can choose your favorite one to make picture slideshow for publishing on MySpace. You can preview your pictures in the selected template. What's more, Photo DVD Maker serves 210+ transition effects and 25+ pan/zoom effects for you to make your photo slideshow more animated and attractive. When you proceed to publish the photo slideshow, it is time to go to the Burn Disc tab and choose "MySpace Uploadable Movie" option, and then click "Create Now" button to export the slideshow in MySpace video format. Step I: Log into your MySpace account to get started creating your MySpace slideshow. Step II: Under the "Upload Photos" box on the Add Photos page, there is a link to add a slideshow. Click on that link. Step III: Click Upload Button and begin to upload your photo slideshow from your PC into MySpace. Making photo slideshow to introduce oneself or share pictures with friends are more and more popular in the young members group. Photo Slideshow Generator offers you great convenience on creating different kinds of dynamic slideshows on any topic, and then upload to MySpace, YouTube, Facebook etc for sharing. Start to make your personal photo slide shows and always be cool!